Your City Sports is your go-to source for high quality custom apparel! Are you looking for a unique sock, beanie, toque, or scarf? Need to round out your team’s uniform? Create a unique tournament prize? Fundraise for your team in a better way…at YCS we do that! We’ve made hundreds of custom designs and can show you a selection of interesting styles, from traditional to very modern and interesting patterns – all done in your colors. Our gear is made in a WRAP certified plant using the latest knitting technology and materials to give you sharp designs, bright colors, and unbeatable quality. We offer low minimum orders (as low as 30 pieces) and quick service: delivered to your door 3-4 weeks after we finalize your design. Once your apparel items are delivered, we’re not finished – this is when we move on to the second part of your order. 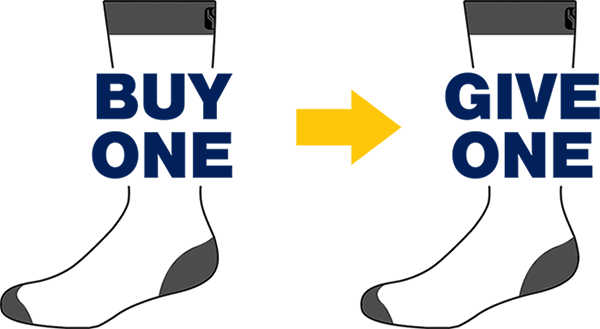 For every item you order, we donate a brand new pair of socks to a homeless shelter or organization in your area. Did you know socks are the #1 need for the homeless? Read more about it here. Email us your idea – or check out our 2019 apparel catalog or our gallery page for ideas. Or email us your logo and color choices and we can suggest a couple designs for you. Whether you choose a “stock” design or create something new and bold and unique, we will help you create something you’ll wear with pride! You can reach us through our contact page, or by email at info@yourcitysports.com. Check our Twitter feed or our Facebook page to see the latest designs!